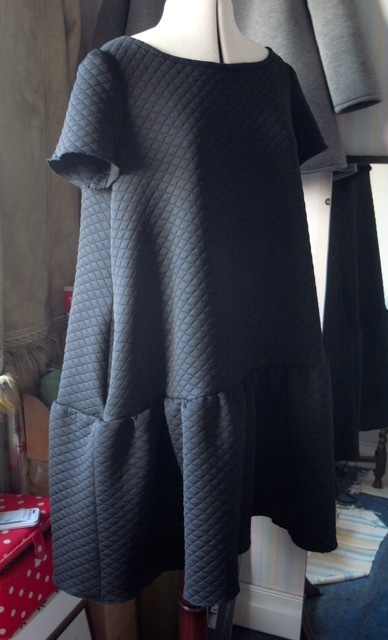 I had just over a metre of fabric left in this black quilted ponte roma. 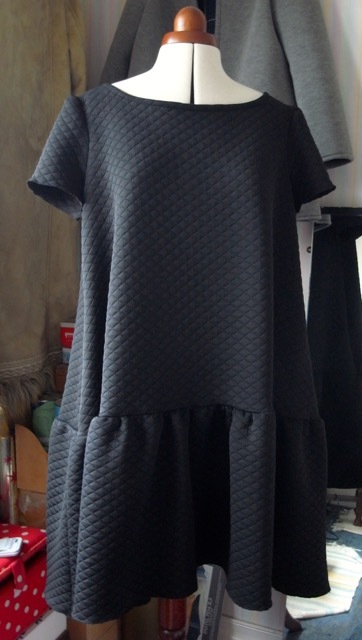 Thought I might have enough to make a sleeveless cocowawa marshmallow dress, without pockets, but didn’t have quite enough for a dress, so I made a tunic length instead. And I’m so so very happy with it. Can’t wait to wear it with this bag. I think I’ve said it before, but I am so happy that I can make the sort of things I like. Stuff you can’t buy in the shops. I will definitely be making many more in this version. I have a Marshmallow dress as a work in progress, has been waiting to be made up for at least a month now. I am now contemplating whether I should make it into this version. I also got a clapper, which I’ve been wanting for a while. And I still have just over £11 left. The grosgrain strap I already had, and think I will use this instead of making the fabric handles out of the same fabric as the bag. I think it will go well. 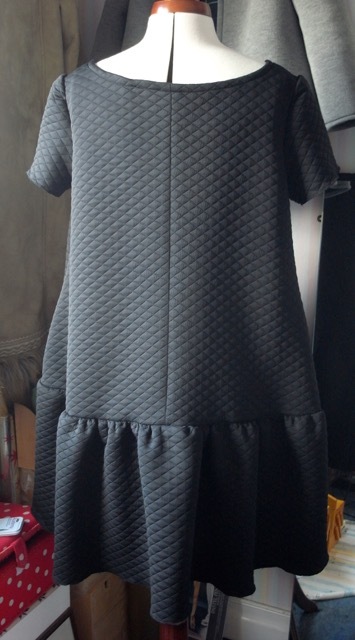 Okay then, second cocowawa Marshmallow dress completed already. 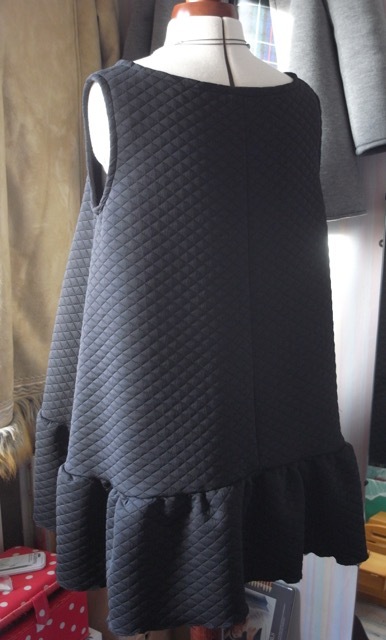 Made this one in a size 10 instead of the 12 and whilst still a little roomy (but I think its meant to be) it is perfect. I’m so pleased I’ve found this pattern, no more Trapeze makes for a while I fear! 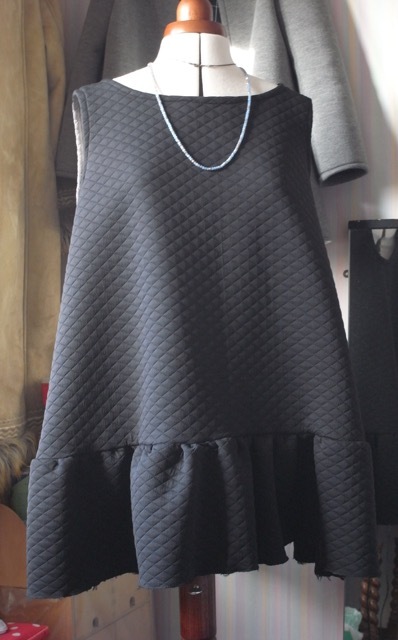 I think the fabric really helps in making this an interesting dress too. 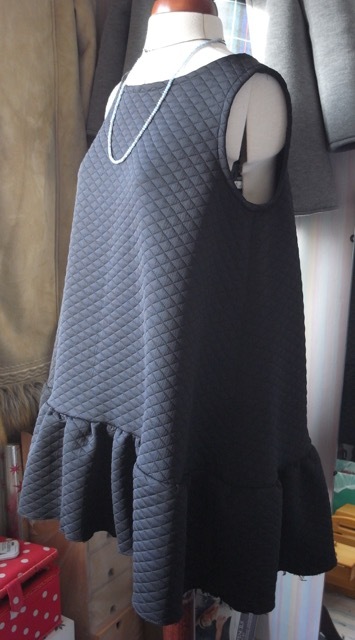 More of the Ponte roma quilted jersey. 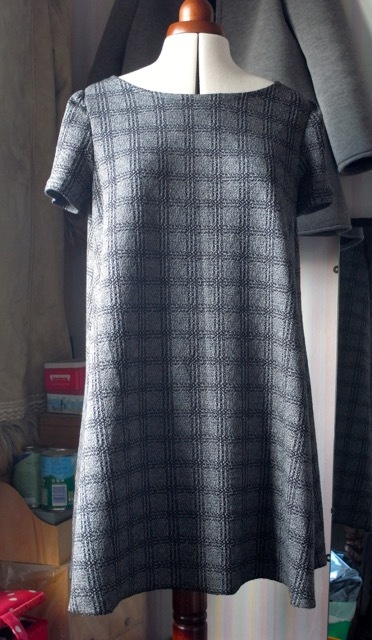 So there we have it, my new favourite dress pattern. Expect to see many many more of these! 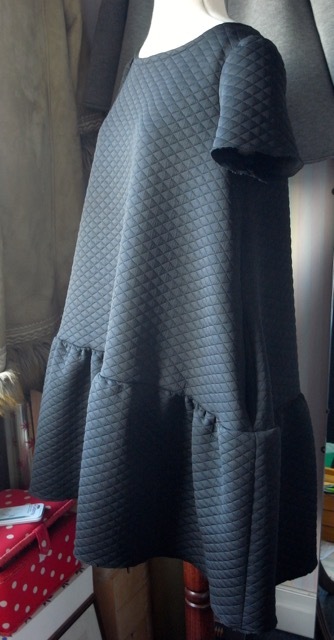 Doesn’t need much introduction, and there’s nothing special about this dress except it marks my return to sewing after 2 months or more of not doing any at all! 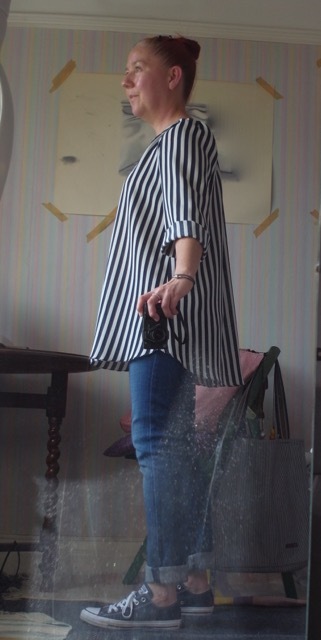 I made it using my tunic length pattern hack, but I added 6cm to make it just a little longer. Quick simple make, Love it! I had a party to go to recently, and I bought a dress! And I rather enjoyed the process of buying the dress. 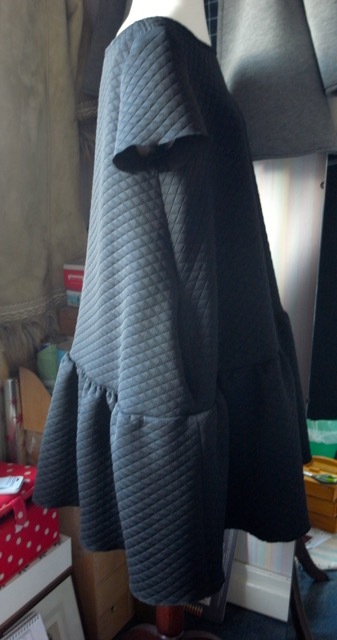 I’d forgotten that it could be quite nice to buy something to wear for a special occasion. 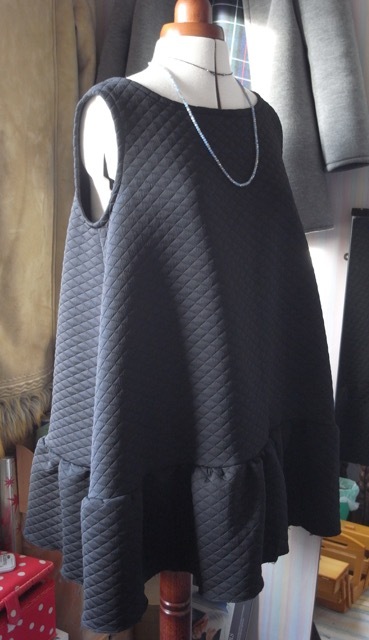 And the dress I bought I would not have been able to make myself, so it is justified. I will also be wearing it boxing day, for a special lunch for my Mum and Dads 60th wedding anniversary. I saw this gorgeous fabric on Minervacrafts.com and had to have it! When it arrived though I was a bit surprised at how stiff and rough it felt. Still I wasn’t put off and I put it in the wash. It felt a little better afterwards. 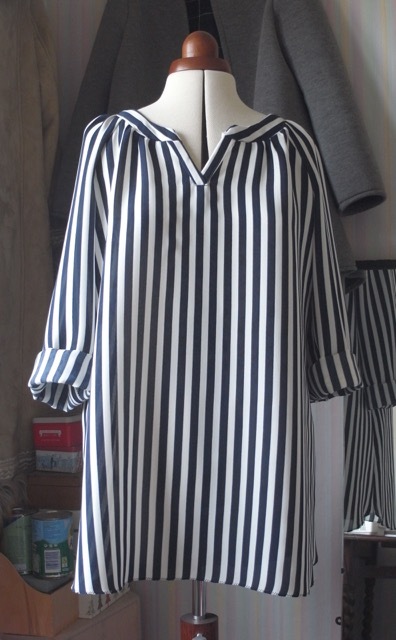 I couldn’t decide whether I wanted to make it into a Trapeze top/tunic or an Imogen, so I pondered on it for a few days and one day after coming back from my power walk I’d made up my mind to cut it out in preparation for an Imogen. I bought 3m and boy am I glad I did. 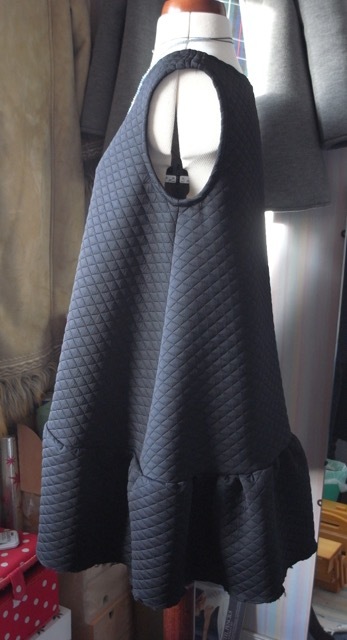 I needed pretty much most of it for the pattern, as the fabric wasn’t very wide. I had hoped I’d have enough to make something else, but no. I had a bit of a love hate working with this fabric, at first it felt stable to work with but then at times I felt like it wanted to stretch. 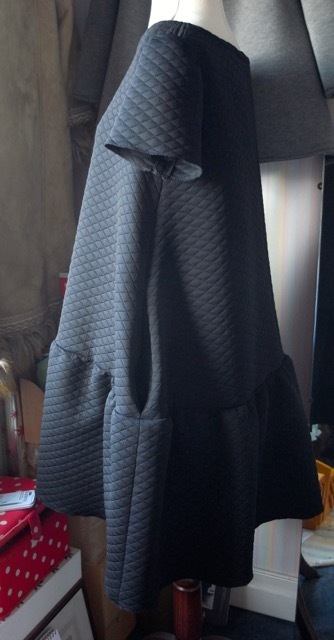 It was horrible to iron, I had to really press hard and do it repeatedly to get any semblance of crispness. 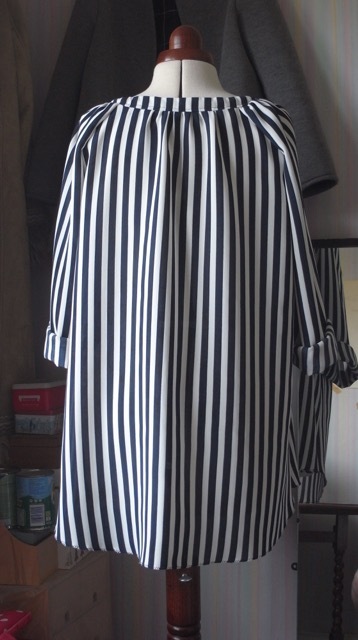 I tried it on before I’d finished it properly and for some reason rolled the sleeves up and was delighted with the look, so I made the decision to not put the elastic in leave the sleeves as roll ups. Don’t think thats the technical term! 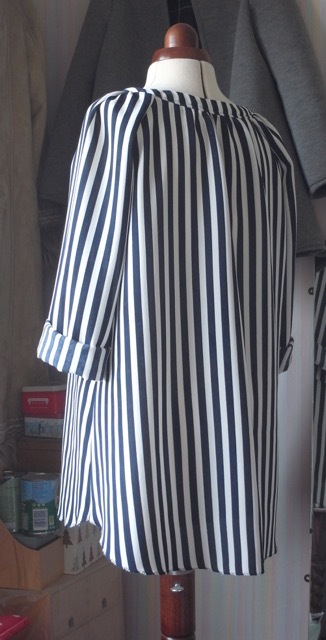 The placket and the collar were the trickiest bits to work with. I still don’t fully understand what I’m doing and it always ends up working by accident or luck, but its never perfect. I’m a bit worried about the fabric at the bottom right side of the placket, I think there’s the potential for a hole! 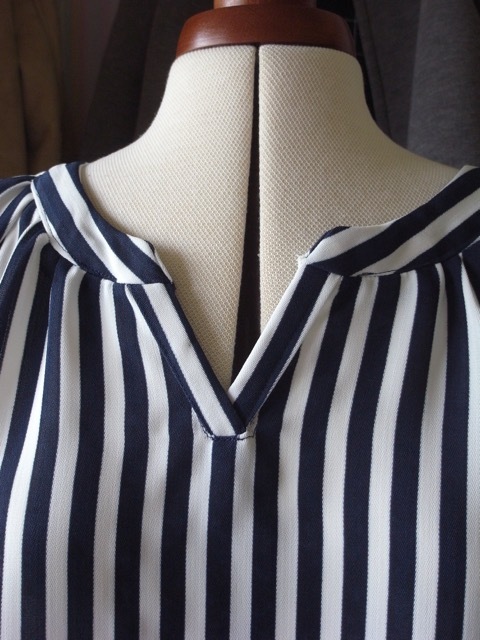 And as for the top stitching at the base of the collar, well that went to pot. Its perfectly wearable though and I shall still wear it with pride. 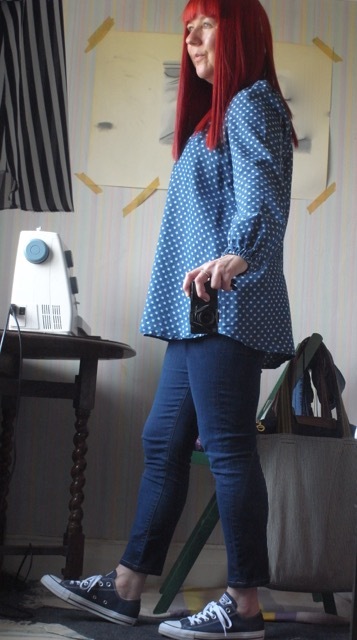 Now for the mod pics… Please excuse the dusty mirror! And here I am wearing it with a red stripey bag. Very happy with it. 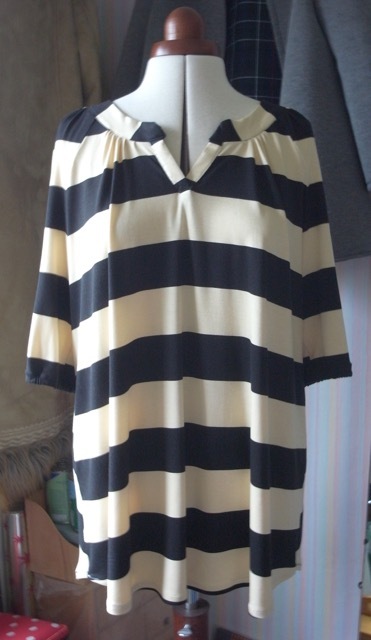 And am now a convert to the vertical stripes. But I couldn’t help thinking it would be better a bit longer. 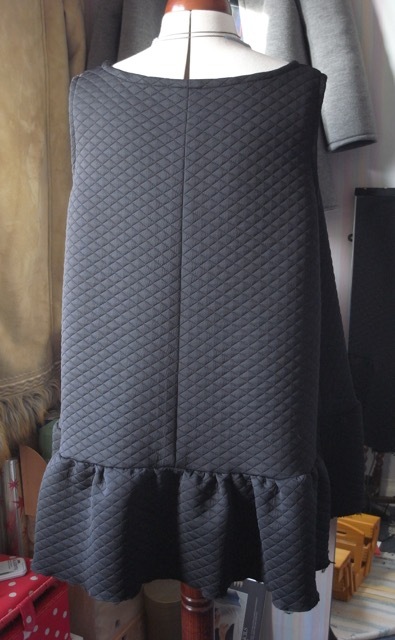 Unfortunately I didn’t have quite enough fabric left to add the amount I wanted to, so I had to settle for half the amount, I had wanted to make it 6 inches longer but could only make it 3″. I’m still very happy though. It might not look that much different, but it feels really nice to wear. I’m still going to make a version with the 6inches though. I’ve had a lot of wear out of these three Trapeze dresses. I have to say I’m really loving them. They are so easy to wear, just fling em on and go. And when the sun is shining and its hot hot hot, you really don’t want to have to think too hard about what you’re wearing. I thought this one was pretty boring when I first made it, but now I really love it. And I can’t stop thinking about a longer one. Wasn’t overly keen on this one either when I finished it, but with the right footwear and accessories its perfect and I feel really good in it! And this baby is one of my all time favourites, made it last year and wore it lots and am wearing it lots this year too. I need some more of this fabric. All three made from the Merchant and Mills Trapeze dress pattern, all slightly different. 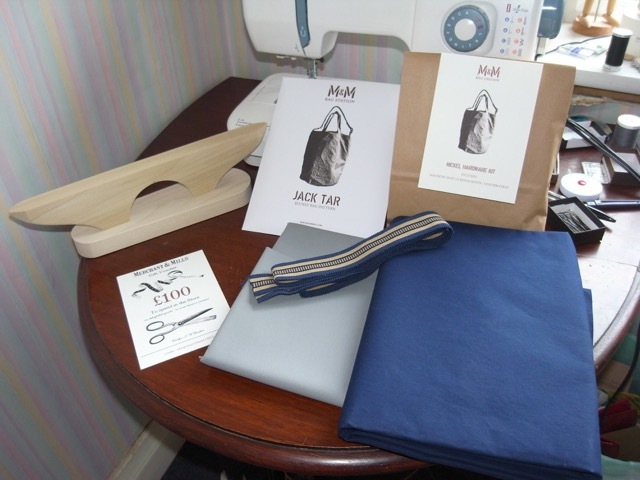 Its amazing how much difference the fabric can make to how a garment turns out. 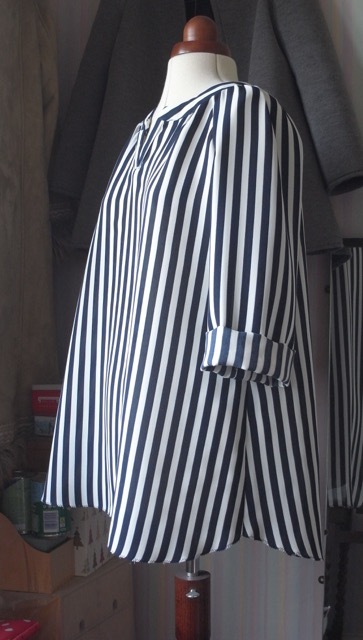 I don’t know if its the fabric or the stripes, I know its not the pattern as the Imogen is one of my faves. I just can’t put my finger on it. I’m hoping it’ll be one of those makes that will eventually grow on me. I have quite a few things I’ve made that I didn’t like or not keen on when first finished, and have since ended up loving. So fingers crossed, as I do hate putting in all that effort and then not wearing it. 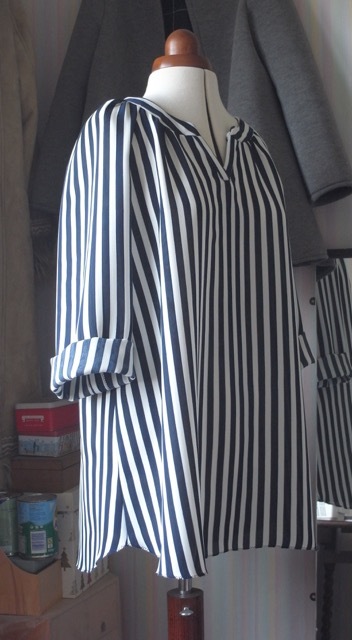 I am quite pleased with the stripe matching across the front and the sleeves though. Didn’t work at all at the side seams, they are way off! So there we are, underwhelmed!